The next time you feel as though your fingers do not have enough blood flowing in that particular direction, it is not as though your spider sense is tingling, but rather, it could be due to the fact that you need a device like the $149.95 Circulation Enhancing Vibration Gloves to help you out. These happen to be therapeutic gloves which are able to vibrate so that they help to stimulate blood flow in the fingers, all the while providing drug-free relief from pain and stiffness – which is great for those who want to wean themselves off painkillers and other kinds of pills. 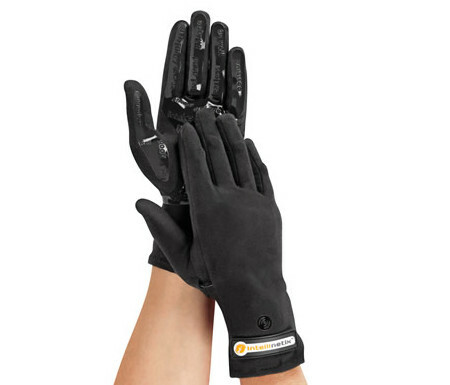 The Circulation Enhancing Vibration Gloves will sport slim nodes that have been strategically placed over each finger and thumb joint, allowing the gloves to deliver a gentle vibration which will help massage away pain all the while improving one’s flexibility. This particular comfortable movement, when merged with a slight compression that has been exerted by the gloves’ slim fit, would end up creating a soothing warmth which is touted to help enhance circulation and ease soreness. The soft gloves themselves are manufactured from a breathable blend of 92% cotton/8% spandex, and they offer a firm grip of whatever you intend to tote around thanks to textured undersides. A 4-hour charge offers up to 20 minutes of treatment. The Peephole Reverser – Who’s in There?